To make someone laugh is difficult job especially when it comes to books. The last time I had so much fun reading a book was when I read Just Married, Please Excuse and though I usually refrain myself from picking books with “Chetan” mentioned on their book covers, this book might have just proved that some Chetan’s deserve a chance. 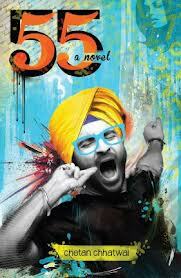 Chetan Chhatwal’s 55 is the story of Arjun Singh a rich Sikh guy living in South Delhi whose biggest concern is to secure seat most coveted college of Delhi University- St. Sebastian. His ambitious plans come to a screeching halt when he scores a paltry ’55’ in English in the board exams. Unable to meet the cut-off, Arjun is then forced to take admission in a neighboring second grade college along with his three best friends. The story is definitely not the best thing about the book but the author has absolutely hit bull’s eye with the narration. He has successfully managed to maintain the balance between humor in the book with the characters , and the pace of the story. You can’t really help thinking about your college life when you read this book and in case you are Delhi University graduate, I can assure you that you would be able to relate with protagonist from the first chapter itself. From the cut-off lists, the ragging, the canteen food, the filthy washrooms to the mention of this coaching center and its eccentric professor whose famous for his quirks in the mathematics department of the university, everything takes you back to those ‘good old days’. The only problem I had with the book was the abundance of toilet humor. I have never understood why people love it and its certainly not my cup of tea so I had to skip alot of pages in between. But apart from this, I thoroughly enjoyed reading the book.